Description: An animal that wanders around, mostly at night. They are a hostile mob, but only during the night. Some think this is a monkey, but it's actually a drop bear. 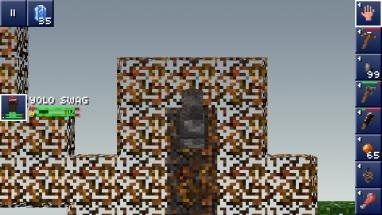 This is the most dangerous mob in game at the moment, because it can damage the player. Where it is: Trees. Look for a leathery texture in trees that do not seem to belong. Also, at night, it will crawl around with glowing eyes. See pictures for examples. Life Cycle: The drop bear lives and ages. It can die if it is in a tree for a long period of time and falls. This is noticeable when drop loot is seen on the base of a tree. Health: Killed from about four hits by fist, two hits by a flint/Bronze sword (thanks Nervid), and one hit from the Iron Sword. Damage: The drop bear deals more or less 1/6th the bar of health and happiness. Attack Pattern: This bear runs around on all fours at night, and is about the speed (or perhaps a little more) than the dodo bird. It DOES attack automatically if you're in range (although only at night). If hit, the bear will attack back; dealing above damage and proceed to crawl away. Drops: The drop bear drops two items. Usually drops an amount of both, but rarely, it drops only one. 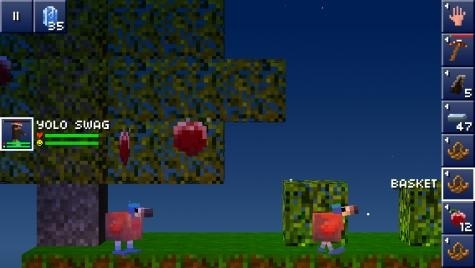 Description: An animal that is known for its delicious meat, this bird is likely going to become extinct again due to hungry blockheads. There are also dodo bird eggs: small blue eggs that can hatch over time (when placed down). These come from mated dodo birds, but they are sorta rare (I've only seen one; played for maybe over a eighty hours of this game). Life Cycle: The Dodo Bird lives and ages and can die of natural causes. Usually, it seems to die around certain plants (flax plants?) though it can probably happen anywhere. The Dodo bird reproduces, and also drop eggs once in a while though it is rare (thanks nailatixela). Health: Takes four hits from a fist to die, two from a flint spear, and one from a bronze sword and higher. Damage: The Dodo bird does not attack the player on any circumstances. Movement Pattern: If attacked, the dodo bird will run one direction for a few seconds, then slow down to the point where the player can attack again. Passive movement is same as the donkey and drop bear. Drops: Two items. Can drop one or both of the items. 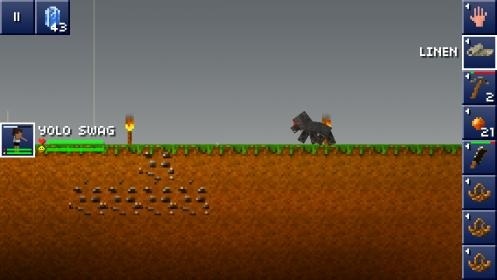 Description: The most exciting mob, in my opinion, which is tame-able and has wonderfully fun controls. There are almost no disadvantages of having a Donkey. Where it is: Reported to be mostly in one of the hemispheres (North) naturally. However, they can be spawned with carrot patches. Personally, I found mine only on the left side of my portal. Life Cycle: Live, can be born as a baby (baby donkeys are not tame-able; trying to tame them with carrots will just make your blockhead hit the donkey with the carrot). 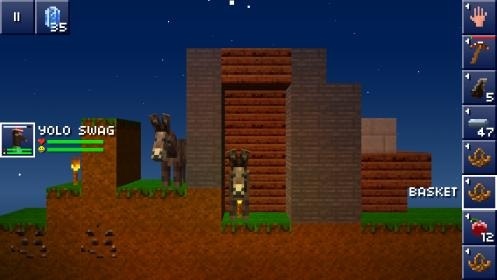 If a carrot farm is created, the donkey will sometimes spawn near the patches. (Not sure if intended or not). Health: [Adult] Dies from 8 hits by player fist, (?) hits by flint spear, (4) hits by bronze sword, (?) hits by iron sword. Damage: The donkey will not hurt the player under any circumstances as of yet. Movement: Same as the dodo bird and crawling drop bear; when hit it will run around for a bit before slowing down after a few seconds. Use a Carrot on a Stick (crafted with one carrot, one string, and a couple of sticks) and click on an adult donkey. If you see your blockhead mounted, and an instruction for new controls (Tilt to move and swipe upwards to jump), then your player is now riding around the world in style. Note that the donkey never dies, does not need to be fed, and when trapped in a small area of land, will not despawn. Also note that the donkey can jump two blocks high, but only if the player is mounting it. It can't jump if the player is not riding it. The donkey also cannot fare well in the water (can't jump, slower speed than the player swimming) so it's advisable to create a donkey stable at the edge of the water. Thus donkeys are the best thing in the game.